but to ensure we’ll be available at the time you want, please call to set up an appointment for your DOT physical exam. 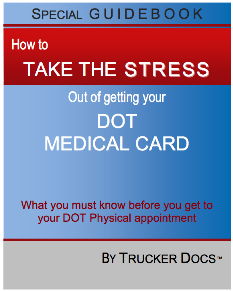 Medical Card: You get the original DOT medical card, form MCSA-5876, to keep with you at all times you are driving. Long Form: You get a copy of the DOT medical examination report, form MCSA-5875. Federal Information Requirements: We update the federal database with your new medical card information. State Information Requirements: It is the driver’s responsibility to update their current medical card information with their state drivers license department. *Utah CDL holders: We fax your medical card information to Utah DMV for you. No trips to DMV necessary! Payment options are cash, credit card, T-check, Com-check, or pre-authorized company account. Call to arrange on-site services for a set of ten or more DOT Physical exams. Drivers — Drug alcohol testing is not part of the DOT physical exam but your Company may request to have drug alcohol testing done at the same time. Companies — DOT drug testing and breath alcohol testing for your drivers. Pre-authorized accounts simplify the process for your company and your drivers. Call or fax our office to set up an account for your company. We take care of your DOT Medical Card process and get it done right the first time at Chiro Stop! Repetitive strain injury builds up over time in long distance drivers. Many drivers come in to see us with back pain. One of the injuries we see often is ‘truckers shoulder’. Others come in with hip and leg pain. Chiropractic adjustment is a key treatment used to help patients get out of pain and improve their ability to perform their work. Active release technique is a soft tissue treatment used to quickly resolve many conditions caused by overuse of muscles and joints. If you have pain, ask Dr. Derek about it. If he can help you he’ll tell you! If it’s not a condition he can help, he’ll tell you that too! Bookmark this page to Dr. Izzy’s Chiro Stop for your DOT physical. I was looking for a new medical office to get my own DOT physicals and to do drug screens for my drivers so we called a couple of places with inquiries… the one we’ve used for years (offices belonging to one of the biggest medical networks in the area) and Derek Parkes. We liked the positive attitude of Dr. Parkes. My physical was due so we made an appointment. Dr. Parkes is awesome. He asks if you have any questions or concerns, goes through your medical history (on your physical form), and does the exam in a professional but relaxed way. He’s a great guy with lots of personality and really goes out of his way to make you feel comfortable AND a little less expensive than the “other guys”. I would highly recommend using his office for all of your DOT exams and drug screens. Dr. Derrick was amazingly patient and very knowledgeable. Took his time and had a great bedside manner! My company will pay for the physical at another place I found to be rude and incompetent. I paid for the physical with my own money and it was worth every penny. I would recommend everyone to get your physical done here. Fast, Friendly and Relaxing. In and out under 1 hour with my updated DOT card. I will not go anywhere else. See you next time. Thanks Doc! Dr Parkes was awesome. He had me in and out in no time. Very professional, straight forward and courteous. Will continue to come here as long as I’m a professional driver. Thank you Dr for your outstanding service.